LCOs are increasing productivity by changing the way they use fertilizers with enhanced efficiency and hybrid products. There’s always a better way to do something—even apply fertilizer. 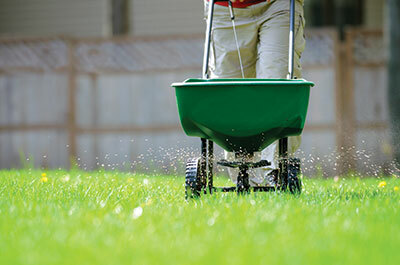 By embracing industry trends, some lawn care operators (LCOs) are saving time, money and manpower by changing the ways they use and purchase fertilizer. In particular, enhanced efficiency fertilizers and organic/synthetic hybrid products are seeing greater adoption. McDonough says he’s seen an increase in lawn care professionals switching to enhanced efficiency fertilizers (EEFs) and using fertilizer blends with higher percentages of EEF technology and fewer fillers, which don’t contribute to plant health. EEFs are fertilizer products that allow increased plant uptake and reduce the potential of nutrient losses to the environment when compared to conventional products. 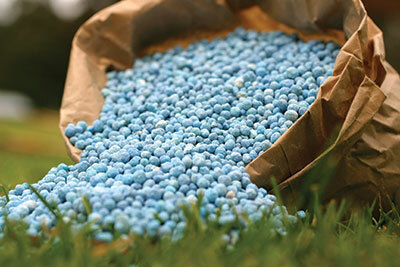 Sulfur- and polymer-coated urea products, natural organic fertilizers and stabilized nitrogen are all considered EEFs. EEFs also allow for more time between fertilizer applications, resulting in the need to buy, store and transport fewer bags of fertilizer throughout the season, McDonough says. In many cases, costs may be higher per bag, but with less filler, EEFs can ultimately lower annual fertilizer costs. “A lot of (LCOs) are smartening up to the fact that they used to buy product that had a lot of filler in the bag with a low analysis and a low portion of enhanced efficiency fertilizer,” he says. “Now they’re realizing if they use a product with less filler and more enhanced efficiency fertilizer, the bag may cost more, but they can cover more ground with fewer bags at a lower cost per acre. Fewer visits to each property is not only an advantage to the contractor but to the homeowner, too, says John Fowler, vice president of sales for Anuvia Plant Nutrients’ turf division. “(Clients) really don’t want to see you a bunch of times, so if you can deliver the same results in fewer visits, that’s a huge advantage to the homeowner,” he says. With the green industry’s ever-present challenge of finding quality employees, the ability to provide fewer annual fertilizer applications per customer or an applicator’s ability to treat more lawns per day reduces labor demands, McDonough says. Jeff Leuzinger, sales manager for Healthy Grow, an organic fertilizer manufacturer in Pearl City, Ill., says the organic fertilizer market has grown considerably over the years. He has seen a particular increase in contractors offering hybrid programs, which use a combination of organic and synthetic products. Leuzinger says the biggest opportunity for future growth in use of organics is in the South where grass grows year-round. Rachelle Kemp, technical services specialist for The Grounds Guys, a full-service landscape firm headquartered in Waco, Texas, with more than 180 franchise locations throughout the country, agrees that hybrid programs are growing in popularity as more consumers become aware of the risks of misusing lawn care products. Hybrid programs are a happy medium for eco-conscious homeowners who still desire a green, healthy lawn. Leuzinger says both customers and LCOs have embraced organic fertilizers for many reasons. New research and technology have resulted in more effective products, and increased effort is being made to understand soil health. LCOs are embracing these findings by incorporating them into their programs. Kemp says she is seeing an increase in LCOs who prefer granular fertilizers instead of liquid versions. She says granular products are easier to apply and have less drift and better residual. Granular products do not require a water source at the time of application, and spreaders are less expensive than spray rigs. Kemp adds that some states allow granular applications without an applicator’s license. Regulations are also playing a role in the way LCOs use fertilizers. Many states have bans or blackout periods that restrict the use of fertilizers containing nitrogen or phosphorus because of their impact on waterways. Leuzinger says this makes it difficult to apply any fertilizers—even organics—because phosphorus is one of the product’s fundamental components. But some states, such as Illinois and Wisconsin, permit the use of phosphorus as long as it comes from a natural source. For example, the phosphorus source in Healthy Grow fertilizers is chicken manure, so it is exempt from the law. McDonough says regulations make contractors and LCOs think differently about how they apply fertilizer, and they also strengthen the case for enhanced efficiency products.